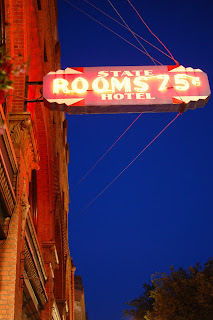 The owners of the stunning Delmar Building on First Avenue have kindly maintained a vintage neon sign advertising Rooms 75c at the State Hotel. The building has made the city's heritage list. And I'm not the only one who was attracted to the photographic possibilities - it looks even better shot on film. This is on my new Nikon 35mm f/1.8G DX lens, hand-held, following the Mariners game last night.